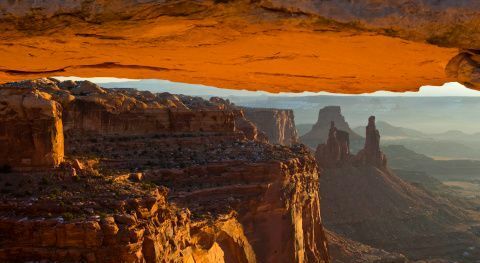 One of the most interesting and scenic state parks in America is located close to Moab in the state of Utah and is known as Canyonlands. The area is full of colorful landscapes that have formed a countless number of canyons, buttes, and mesas close to the powerful Colorado River and its tributaries. The park is divided into four areas by the rivers. These are known as the Needles, Horseshoe Canyon, Island in the Sky, and the Maze. The rivers also make up a fifth section of the park. The atmosphere created is desert-like and each area possesses its own unique character with various opportunities for exploring. 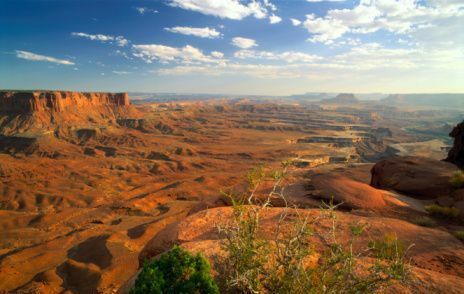 Canyonlands National Park is open all year round and is an ideal place for exploring the natural beauty and wilderness of the region. There is plenty to do and see there with some of the most popular activities being camping, mountain biking, hiking and boating. During the winter months the park becomes a wonderland with the opportunity to engage in many types of winter sports, depending on the amount of snow. The climate at the park is quite dry with most of the precipitation falling in the early part of spring and the latter part of the summer. It can get quite hot during the summer as temperatures can soar to 100 degrees Fahrenheit. It’s milder in the fall and spring, but the temperatures can still reach into the 70’s and 80’s. During the winter the thermometer usually hits between 40 and 50 degrees in the daytime, but it can get down below freezing at night. The best way to fully realize the beauty of the park is to take a car or four-wheel drive vehicle as there’s quite a lot of ground to cover and so many regions to explore. The local area also has numerous interesting attractions to visit.